Authors: Rossi, A. M.; Murphy, T. E.; Reipa, V.
Abstract: We report stable photoluminescence from 6H silicon carbide nanocrystals dispersed in three different solvents: water, hydrofluoric acid, and toluene. 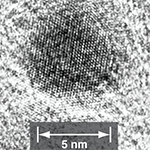 Transmission electron micrograph surveys reveal a size distribution that contains a significant fraction of monocrystal particles with diameters below 3 nm—small enough for quantum confinement to play a role in increasing the effective bandgap energy. The ultraviolet photoluminescence band observed at 3.5 eV in the colloidal solutions is consistent with quantum confinement estimates based on the effective mass model.